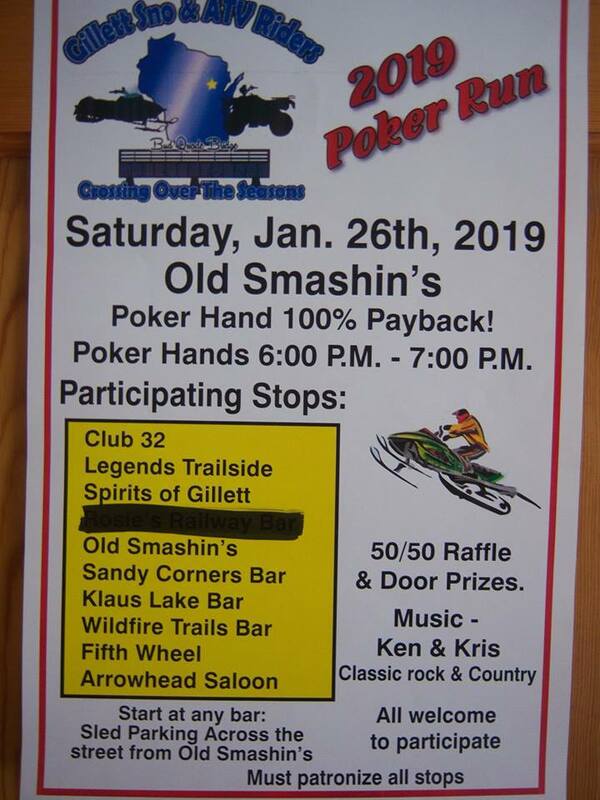 Gillett Sno & Atv Riders annual snowmobile poker run will be Saturday, January 26. There will be 9 stops. Club 32, Sandy Corners, Spirits, Wildfire, 5th Wheel, Klaus Lake, Legends Trailside, Arrowhead Saloon & Old Smashins. $10.00 per card. Poker run is 100% payback. Ride ends at Old Smashins with lunch, door prizes, poker hand winners. poker hands will be from 6:00-7:00. Also music by Ken & Kris, classic rock & country. Come join us for a fun day!! Must patron all stops! !